“The first sawfish to scrape the hull of the now not-so-new Hell’s Bay Neptune was captured in Florida Bay and now is happily swimming around with an acoustic tag attached to its dorsal fin. It took close to three hours for Yannis and I to reel her in (with the expert assistance of Johanna at the wheel), so it was dark by the time we got her to the gunnel. She came in at just under 14 ft in length. 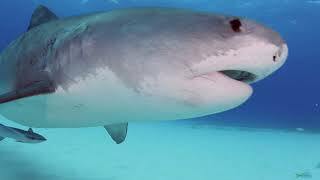 Her dorsal fin had suffered a previous but still-healing injury, perhaps at the mouth of a shark as she had some scars on her body that also may have been sharky. The first fish caught aboard the vessel was a ladyfish landed by Bethan and first elasmobranch was a blacktip shark. The ladyfish were our chosen bait for saws, although the one we landed took a jack. Our fishing guide, Capt. Jim Wilcox from Bud n’ Mary’s, got us oriented to channels and secret short-cuts, put us on sawfish, and generously shared his fishing techniques with us for two days, allowing us to strike gold on our first day fishing solo. I believe he likes the Neptune a bit. In recognition of the first species landed, its euphonious generic name, and the fact that “ladyfish” seems so apropos given the tradition of giving a vessel a feminine name, we now refer to “our new boat” as the R/V Elops in recognition of the strength and superior fight that comes in small packages, Elops saurus and the Hell’s Bay Neptune. Say what you will about bonefish, in Florida Bay ladyfish are queens of the flats!